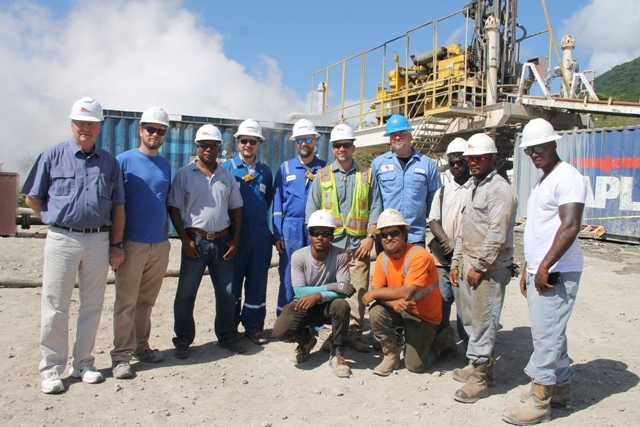 NIA CHARLESTOWN NEVIS (March 19, 2018) — A team from the United States of America (USA) based GeothermEX contracted by the Nevis Renewable Energy International (NREI) to determine the status of the geothermal test well at Hamilton, says their findings confirm the requisite temperature and flow necessary for a sustainable supply of geothermal energy on Nevis. Mr. Robert Stacy, Senior Reservoir Engineer with the team said on March 16, 2018, the resource looks promising. “We are with the well flowing very nicely. High temperatures coming along and plenty of steam coming up from the resource. Very excited to see this. Plenty of energy has gone into this project to achieve what’s culminating here today. Very happy to be here to make this become a reality. GeothermEX is a subsidiary of Schlumberger Company, the largest oil field testing company in the world. 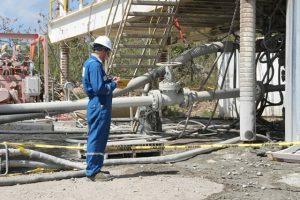 However, GeothermEX focuses specifically on geothermal energy testing. As of Monday March 19, 2018, the tests results at Hamilton continue to hold steady with surface reading temperatures of 255 degrees Fahrenheit; steam temperatures of 411 degrees and well temperature readings of over 400 degrees. 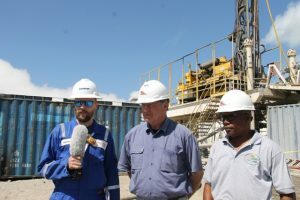 An elated Mr. Bruce Cutright, Chief Executive Office of NREI says they have waited, on behalf of the people of Nevis for five years to get to the well testing stage. He described the project as a difficult but a rewarding one. “It has been a tough project to work on. We know that the people of Nevis have been waiting 10 years to see this flow rate that is behind us. This will transform the island. “This is the most exciting test that you could imagine. You could see the steam behind us is flowing at a rate which demonstrates to us that this is a commercial scale geothermal reservoir that is beneath the island of Nevis. This will supply the electrical energy needs for the entire island. So we are very pleased to see this. Again long road to get here but this is the success story that you see with the steam coming off the reservoir,” he said. Mr. Cutright added that the testing operations at Hamilton are completed. Though the drilling plan was to go to 400 feet, they entered the geothermal reservoir which has a capacity exceeding 5 megawatts of energy before. 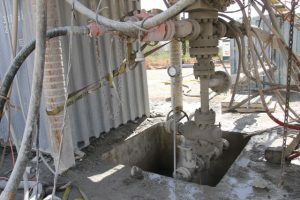 Drilling for the production wells on the site are expected to begin late this summer. 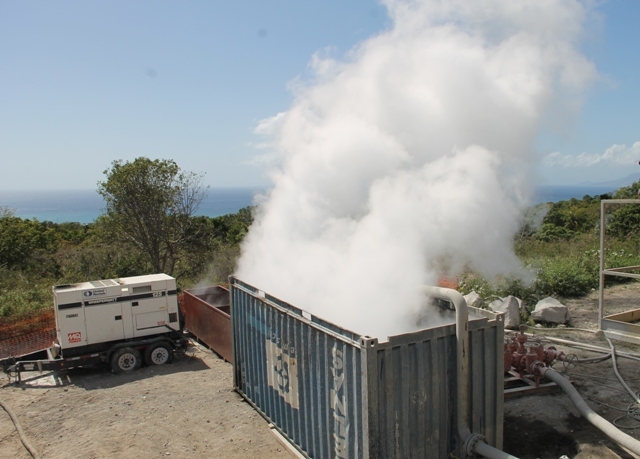 Mr. Mackie Tross, NREI’s local representative who was also present said he was excited that they had arrived at a two phase system producing both water and steam and is looking forward to the geothermal project becoming a reality.